Taking a minute to review the following info about basketballs is guaranteed to not only save you time and money, but also ensure you buy the ball best suited for your player. If you're new to youth basketball and researching equipment for the first time, it can be a little overwhelming. 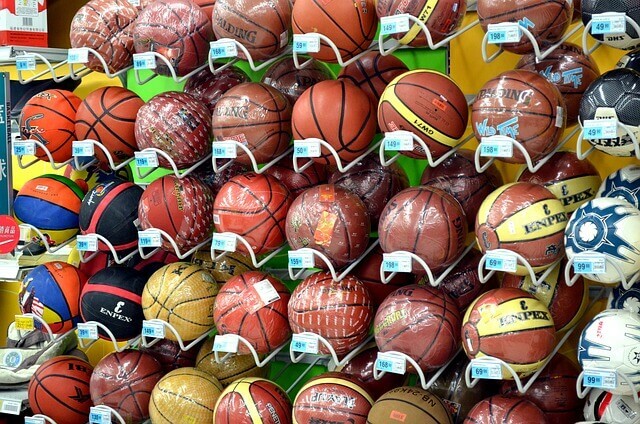 Especially with so many different kinds of basketballs for sale, how do you know which one to choose? Hopefully, this quick guide will answer your questions and maybe address some you didn't even know you had. It should certainly help you narrow down your search. Size definitely makes a difference. It's the first thing to consider before purchasing any type of equipment. Basketballs come in a variety of sizes designed specifically with the physical characteristics of players in mind, like hand size and strength. Basketball leagues have specific regulations concerning ball sizes, and it's important for players to practice with the same size ball they'll be using in competition. Plus, players will have more success using a ball that's easier for them to handle. There are 3 basic choices of ball covering. The type of material you need depends on whether the ball will be used indoors or outdoors and the skill level of the player. The cover is made from 100% genuine leather that provides a soft, broken-in feel over time. These are the most expensive type of balls, and they're the ones used in regulation play at all levels. Leather basketballs should only be used indoors because rough outdoor surfaces and extreme weather tear them up. The cover is constructed from man-made materials which simulate the characteristics and durability of leather at a much cheaper cost. They are already soft and broken in right out of the box. They can be used both indoors and out. The cover is a durable rubber material that's perfect for outdoor surfaces and weather conditions. They're the cheapest type of ball you can buy because they're the lowest quality. They tend to be quite bouncy, have a tendency to become lopsided, and have a rough texture that can irritate the fingers after long periods of use. Basketballs are built by putting panels of material together that are separated by channels. Some balls have wide channels which offer better ball control by providing more area for the fingers to grip. As a player, I actually prefer balls with wide channels. Choosing between wide and narrow channels is purely a player preference. As a sports mom myself, I understand that, in the end, cost is definitely a factor. The cost of playing youth basketball adds up quickly. Registration fees. Uniforms. Shoes. Basketballs. Goals. Etc. When you're first starting out and not sure if your child will even like playing basketball, go cheaper. Go versatile. Get the most bang for your buck. Leather basketballs are in the range of $50-130. Synthetic basketballs are in the range of $20-65. Again, this just gives you a general idea. You can certainly find some that cost more or less. Though rubber is my least favorite type of ball in terms of performance, it's a great choice for beginners and may be perfect for your situation and for the amount of time your child will actually use it. If your kid shows an interest in the game, you can always buy up. Personally, I prefer synthetic leather balls. I love their performance, feel, versatility, and durability. With rubber balls, there are lots of choices when it comes to colors. You can also get personalized basketballs in just about any color combination complete with your own team logo! How about neon basketballs that glow in the dark for a little nighttime fun! And of course mini basketballs for kids come in lots of fun colors and kid-friendly designs. When it comes to the higher quality synthetic and leather balls, color choices are much more limited. Variations of brown are the standard, though black isn't uncommon. Wilson came out with a WBCA Pink Zone® game ball as part of a global effort to help college coaches raise breast cancer awareness on the court, across their campuses, in their communities, and beyond. The official charity of the WBCA Pink Zone® is the Kay Yow Cancer Fund™. Kay Yow was an amazing women's basketball coach at NC State who lost a long, brave battle to cancer. For every Pink NCAA® Official Game Ball that is sold, Wilson will donate $15 to the Kay Yow Cancer Fund™. Typically, the higher quality the ball covering, the longer the durability. However, that's only true if the ball is used in the proper environment. For example, leather balls have a long life span. Spalding claims every one of their basketballs has a life expectancy of 40,000-50,000 bounces. That sounds like a lot of bounces to me. But if that leather ball is used outside in hot, cold, wet weather or on rough cement, it can't be expected to reach its maximum potential durability. I've been very pleased with the durability of synthetic balls I've used. Year in and year out when I pull them out of storage in my garage they perform really well. Spalding has a composite Never Flat basketball, they guarantee holds air 10x longer than traditional basketballs. I can't verify if that's true, but the ball gets pretty good reviews by lots of users. Of the three, my experience has been that rubber balls typically wear out the fastest. They either start to lose air or lose their true roundness and don't give a good bounce over time. But what can you expect when you buy cheap basketballs? Inflating your basketball properly is important to get the best performance. Both under-inflating and over-inflating can negatively affect the way the ball bounces. There's a stamp on every ball near the inflation valve stating the recommended inflation level. Most basketballs require 7-9 pounds of air for optimal performance and can easily be pumped up with a manual pump. If you ever need to deflate your basketball for storage or packing, it's recommended you leave about 3-4 pounds of air in it. I've made the mistake of completely deflating them for more compact storage but then discovered when left unused for a period of time, the outside panels and channels were dry rotted or cracked. Typically, basketballs don't need to be cleaned. If, for some reason your ball does, cleaning it with soap and water does the trick. But avoid soaking the basketball. Excessive water will damage a leather ball. 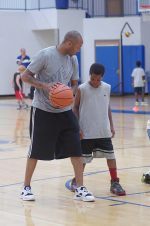 Youth leagues - Unlike high school, college, and the pros, when it comes to youth basketball, there's no governing organization that regulates the brand of ball to be used. High school - I imagine this could change by state, but the NFHS (National Federation of State High School Associations) has approved Wilson and Spalding basketballs for high school boys and girls competition. I know the University Interscholastic League in Texas states that Spalding is the official game ball of the UIL. NCAA - Wilson is the official game ball for men's and women's college basketball. NBA & WNBA - Spalding is the official game ball for men's and women's professional leagues. Little Tikes Basketball is a great way to introduce toddlers to the game! They provide goals and balls perfect for little ones. And mini basketballs are perfect for preschoolers.